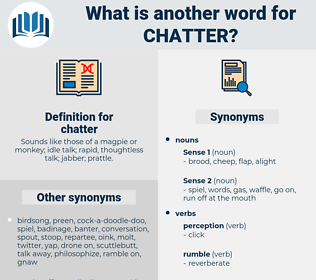 What is another word for chatter? Sounds like those of a magpie or monkey; idle talk; rapid, thoughtless talk; jabber; prattle. chitchat, gossip, conversation, buzz, banter. calm, serenity, hush, still, Silentness, lull, tranquillity. The others laughed, and he led them on to general chatter, under cover of which Vane presently drew Drayton to the door. He had enjoyed his breakfast, and had been entertained by his wife's chatter. prattle, blether, prate, idle talk, chin music. talk, verbalise, mouth, utter, speak, verbalize.